-- We have six gubernatorial ratings changes this week, as shown in Table 1 and described below. We also have two House ratings changes. -- Democrats should net governorships, and more than just a few, but there's a lot of uncertainty. To wit: Three of the ratings changes benefit Democrats, but the other three are in favor of Republicans. -- Watch the Midwest. The Republicans control five of the six governorships on the ballot this fall from that region, but the Democrats hypothetically could sweep all six or at least win several of those races. Let's start with Wisconsin, where Democrats selected state Superintendent of Public Instruction Tony Evers (D) as their nominee on Tuesday night. Evers was probably the most credible candidate in a very crowded field, and polling has shown battle-tested but polarizing Gov. Scott Walker (R-WI) in a perilous position. He trailed 1 in two polls released late last month, and given the political environment -- which seems like it will be at least somewhat pro-Democratic/anti-Republican this fall barring some sort of drastic new development -- it appears that if Walker wins, it will only be by a margin smaller than the roughly six-to-seven point margins he enjoyed in his three previous victories (regular elections in 2010 and 2014, and a recall in 2012). We were waiting to move this race to Toss-up until the primary 2, but it's been clear for a while that Walker is in a tough spot. One bright spot for Republicans in Wisconsin, though, is the open WI-1, where Speaker Paul Ryan (R) is retiring. Primary voters chose Bryan Steil (R), a University of Wisconsin system regent and former Ryan aide backed by the speaker, and Randy Bryce (D), an ironworker who became a national fundraising sensation when he was running against Ryan. Two things work in Steil's favor: Bryce has some liabilities, such as what the Associated Press summed up 3 as “a history of legal and financial trouble,” and, more importantly, WI-1 is considerably right of center. Trump carried it by 10 percentage points and a Republican-backed state Supreme Court candidate carried it a few months ago 4 in a statewide race that the Democratic-backed candidate won statewide by double-digits. So we're moving WI-1 from Toss-up to Leans Republican, with the caveat that a Bryce win would not be shocking in this environment. In Minnesota, voters selected Rep. Tim Walz (D, MN-1) and 2014 gubernatorial nominee Jeff Johnson (R) to face off in November. To us, this was about the best possible outcome for Democrats. Walz defeated state Attorney General Lori Swanson (D), who entered the race late and struggled with recent stories from The Intercept questioning whether her professional staff was pressured into doing political work on her behalf 5, and state Rep. Erin Murphy (D), who probably was more left of center than Walz. Meanwhile, Johnson handily defeated former Gov. Tim Pawlenty (R), who national Republicans recruited into the race. We're moving the open Minnesota gubernatorial race to Leans Democratic. There are six governorships at stake in the Midwest, and all are rated Toss-up (or worse) for Republicans: Illinois is rated Likely Democratic, meaning that we think wealthy businessman J.B. Pritzker (D) is a significant favorite over Gov. Bruce Rauner (R). So that means, in our ratings, Democrats are favored in Illinois and Minnesota and are in Toss-up races in Iowa, Michigan, Ohio, and Wisconsin. The Midwestern governorships are huge prizes in the battle for the U.S. House of Representatives, because the governors elected this year could play a major role in post-2020 redistricting in up to five of the six states (Iowa, which only has four House members and uses what is effectively a nonpartisan redistricting process 6, is the exception; Michigan will decide on a ballot issue this November that could establish a nonpartisan redistricting commission, and Ohio voters made the process more bipartisan earlier this year). Of the six Midwest governorships mentioned here, Republicans currently hold all but Minnesota. It is possible that Democrats could win all six this year. Realistically, they should win at least three and probably four of the six, given the trajectory of the cycle. If they don't, that would mean missing a golden opportunity. In the Northeast, meanwhile, it's not impossible that Republicans could sweep all six governorships in New England this year. They have strong incumbents, and are favored to at least some degree, in Massachusetts (Charlie Baker), New Hampshire (Chris Sununu), and Vermont (Phil Scott). Scott faced some primary opposition on Tuesday night thanks largely to his support of new gun regulations, but he still looks fine in November against former Vermont Electric Cooperative CEO Christine Hallquist (D), who would be the first transgender governor in American history if she were to unexpectedly upset Scott. The fourth New England governorship held by Republicans is in Maine, an open seat. We've previously viewed Maine as a Leans Democratic pickup, owing to the national environment and a potential desire for change after eight years of term-limited and controversial Gov. Paul LePage (R). However, the race has developed in such a way that we're not so sure the Democrats are favored anymore. Either state Attorney General Janet Mills (D) or businessman Shawn Moody (R) will be the next governor, but there are two other candidates in the race who probably will hurt Mills more than Moody in a state where governors are often elected without a majority (the last four gubernatorial elections produced plurality winners). Maine voters adopted a ranked-choice voting system requiring candidates to garner majority support to win, but that system will only be used in federal races in November 7 (ranked-choice was used to pick the gubernatorial nominees, though). A recent Suffolk University poll demonstrated the Democratic dilemma 8: Mills and Moody were tied at 39%, with the two non-major party candidates taking a combined 7% of the vote, and we've heard of at least one other poll that shows something similar. So we're going from Leans Democratic to Toss-up in Maine. In conjunction with this change, we're also shifting ME-2, the congressional district that covers most of Maine's land area, from Leans Republican to Toss-up. Rep. Bruce Poliquin (R, ME-2), the only Republican in New England's combined House delegation, won a surprising victory in 2014 and a surprisingly large (nearly 10 points) reelection margin in 2016, but he will have to reckon with ranked-choice voting in his race along with a potentially strong Democratic challenger in state Rep. Jared Golden (D). Trump won this district, along with its one electoral vote, by about 10 points in 2016, though the district leaned Democratic before that at the presidential level. This year will provide a good test as to whether ME-2 is still a battleground or not, and we expect a highly competitive race. Back to the governors. Also in the Toss-up category is Connecticut, where businessman and 2006 Senate nominee Ned Lamont (D) will face businessman Bob Stefanowski (R) after the Tuesday primary. Connecticut is Democratic but often elects Republican governors, and outgoing Gov. Dannel Malloy (D) is very unpopular 9 and barely won in his victories in 2010 and 2014. There seems to be a generic desire for change in Connecticut that could work against Lamont. Based mostly on incumbency, we give New England's other Democratic governor, Gina Raimondo of Rhode Island, a small edge, but she should have a very hard race. Democrats have to hope that national factors, namely antipathy to the president, trickle down the ballot in New England, where Trump generally did poorly (although he came within a few tenths of a percentage point of carrying New Hampshire and lost Maine statewide by just three points). Given the nationalization of American politics, that Democratic hope may end up being justified, although even if the close races break against the Republicans, they probably still will be in a better position in New England at the gubernatorial level than one might expect. While conceding the nationalization of American politics, if there is one place where party polarization doesn't seem quite as absolute, it is in governor's races. Some voters approach the contest for their state's chief executive in a slightly less ideological way than races for Congress. There's a bit of the presidential process at work, since they are judging the past term(s) of the incumbent governor and deciding if they want more of the same or a new direction. Enough swing, independent voters remain in key states so that this different screen can produce contradictory results -- electing a senator of one party and a governor of another, for example. It certainly doesn't happen everywhere -- there are states, both red and blue, that have had the same party controlling the governorship for many, many years. Still, it can explain some of the surprises we see in statehouse results, and it is something to keep in mind as we approach November. This dynamic helps explain why an otherwise dark red state like Louisiana could have a Democratic governor while dark blue Massachusetts has a Republican governor. Down the coast from New England, in Maryland, there's another blue state Republican governor who appears to be in good shape. Gov. Larry Hogan (R-MD) has sky-high approval ratings and is right around the magic 50% vote share in polling needed to hold off his opponent, former NAACP president Ben Jealous (D). Patrick Gonzales, a shrewd pollster who probably was the first major observer to realize Hogan's potential to win back in 2014, recently polled the race and found Hogan ahead 52%-36% 10. A recent internal poll 11 from the Jealous campaign even found the Republican incumbent ahead 49%-40%. Jealous, running as an unapologetic liberal, may not be a great fit even in liberal Maryland given that Hogan was elected as part of what might best be described as a tax revolt against then-outgoing two-term Gov. Martin O'Malley (D). There's always a chance that a big Democratic wave could wipe out Hogan -- that's what happened to the last Maryland GOP governor, Bob Ehrlich, in 2006 against O'Malley -- but we see Hogan's odds as improving and we're moving the race from Leans Republican to Likely Republican. Moving south, we continue to be skeptical that former state House Minority Leader Stacey Abrams (D) can ultimately beat Georgia Secretary of State Brian Kemp (R) after the latter won a runoff with the help from President Trump. Georgia is a racially-polarized and right-leaning state, which to us probably gives an edge to Kemp, who is white and conservative, over Abrams, who is black and liberal. But the potential for strong black turnout and a poor environment for Republicans hurting Kemp suggests that our Likely Republican rating is probably too bearish for Abrams. We're moving the open Georgia gubernatorial race to Leans Republican. Keep in mind, though, that the winner has to actually get 50%+1 to win outright in November. If no one does that -- there is a Libertarian on the ballot -- there will be a December runoff, where turnout may be lower and the electorate potentially more Republican. The presence of a runoff, to us, helps Kemp because it ensures that Abrams can't win with a plurality. Meanwhile, we're now less than two weeks away from the Florida primary, where it appears as though Rep. Ron DeSantis (R, FL-6) and former Rep. Gwen Graham (D, FL-2) are the frontrunners in their respective primaries. This is probably the best matchup that Democrats could have hoped for if it in fact materializes: Democratic insiders like Graham, whose father is a former senator and governor, better than the other Democratic candidates, and DeSantis, who is endorsed by the president, may be a more polarizing candidate than Florida Commissioner of Agriculture Adam Putnam (R), the one-time GOP frontrunner. The eventual nominees will be competing for the right to succeed outgoing Gov. Rick Scott (R), who is running a spirited and well-funded challenge to Sen. Bill Nelson (D-FL). Superficially, Florida seems easy to analyze: It barely voted for Trump, so many expect it will swing back toward the Democrats in 2018. But it may not be so simple. Trump's approval rating has generally held up in Florida 12 better than in other perennially competitive states, and little from early voting or voter registration changes suggest a Democratic surge, as Politico's Marc Caputo recently noted 13. So very close competition may be the better prediction for Florida, as our dual Toss-up ratings in the gubernatorial and Senate races indicate. Finally, on the West Coast, we now see more potential for a GOP upset in a Democratic state, Oregon. Gov. Kate Brown (D-OR) has generally had middling approval ratings since she took over for Gov. John Kitzhaber (D) under a cloud of scandal in early 2015. Brown won the remainder of Kitzhaber's unexpired term in a 2016 special election, but her seven-point margin of victory was relatively weak. She's facing state Rep. Knute Buehler (R), whom she defeated in a 2012 race for Oregon secretary of state. Buehler is running as a moderate, including highlighting his support of abortion rights 14, which strikes us as a smart move in a liberal state (other Republicans have had success in blue states by presenting themselves as agnostic or even pro-choice on the abortion question). One would still rather be the incumbent Brown in a blue state that hasn't elected a Republican governor since 1982, but our understanding is that the polling is close enough that an upset is possible. We're moving Oregon from Likely Democratic to Leans Democratic. One race that probably is not getting more competitive is in Hawaii, where Gov. David Ige (D) won his primary on Saturday over Rep. Colleen Hanabusa (D, HI-1) after lagging badly in early polling. Ige seemed to be in rough shape after a false missile alert shook the Aloha State in January, but he recovered in part by generally receiving high marks for his administration's response to recent volcanic eruptions and flooding. He will face state Rep. Andria Tupola (R) this fall. Republicans have held this governorship in the recent past, but there's not much reason to think Ige will be in much trouble in this environment. As it stands, Republicans control 33 governorships, Democrats control 16, and an independent, Gov. Bill Walker of Alaska, controls the 50th. Alaska happens to be the top Republican pickup opportunity in the country because Walker and former Sen. Mark Begich (D) might split the Democratic vote in a state that already leans to Republicans. That could benefit former state Sen. Mike Dunleavy (R), the likely GOP nominee. The deadline for candidates to remove themselves from the ballot is Sept. 4. If this remains a three-way race after that date, we likely will favor the GOP going forward. 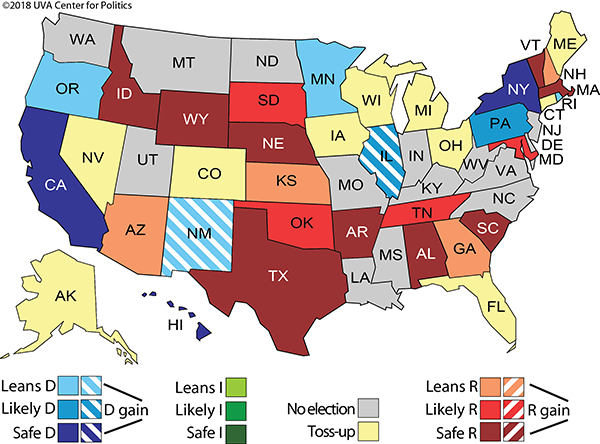 That said, most of the states that are likeliest to flip are already held by Republicans, meaning that the Democrats could have considerably more governorships next year than they hold now (if they don't, this year will have been a giant missed opportunity for Democrats). We have previously pointed to five big states as a way to measure which side “wins” this November in the gubernatorial battle: Florida, Illinois, Michigan, Ohio, and Pennsylvania. The GOP currently holds all but Pennsylvania, a Likely Democratic hold. Democrats are also favored in Illinois. That leaves Toss-ups in Florida, Michigan, and Ohio. We figure the Democrats should win at least one -- Michigan is the likeliest, in our estimation -- and possibly more. So that's a long way of saying that the gubernatorial races, on balance, seem to be going decently well for Democrats, but there may be a lot of very close races and the range of possible outcomes remains somewhat wide.